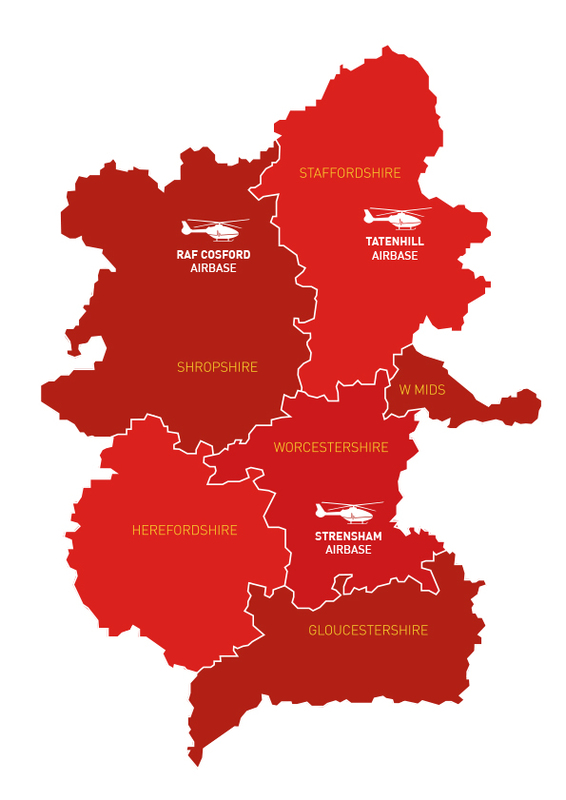 Midlands Air Ambulance Charity (MAAC) operates and funds three air ambulances covering six Midlands counties including Gloucestershire, Herefordshire, Shropshire, Staffordshire, Worcestershire and the West Midlands. Funded entirely by donations, the charity relies on support from local people and businesses, to raise the £9 million needed to undertake on average 2,000 missions every year. We do not receive funding from the Government or National Lottery. Since 1991, MAAC has responded to over 50,000 missions, making it one of the busiest air ambulance services in the UK. Find out more about the Midlands Air Ambulance Charity's history. Operating from strategically located regional airbases at RAF Cosford in Shropshire, Strensham in Worcestershire and Tatenhill in Staffordshire, our air ambulances can reach 90% of the region within eight minutes. Our aircraft each carries a crew comprising a pilot, two paramedics or a paramedic and flight doctor, plus full life-support medical equipment. Three rapid response vehicles are deployed when the helicopters are unable to fly, due to bad weather for example. In addition, our critical care car, manned by a critical care paramedic, is based in Birmingham and the Black Country and attends medical emergencies on a daily basis, including heart attacks, cardiac arrests, strokes, sepsis and respiratory issues. The charity responds to some of the most traumatic incidents including cardiac arrests, road traffic collisions and sports injuries. The aircraft reaches remote locations to attend to patients unreachable by land ambulance. “We’re tremendously lucky to be supported by the people of the Midlands, year in, year out. Without their donations, volunteering support and fundraising efforts, we simply wouldn’t be able to operate our lifesaving service. “Patient care is at the forefront of everything we do, which is why all of our aircrew are trained to specialist trauma paramedic status. This ensures they are equipped and experienced enough to deal with the most traumatic incidents.